Children's Rights are a thorny issue. South Africa has a great Constitution and Bill of Rights. It is signatory to many international conventions on children's rights as well. But the theory and the practice are too different things. The University of the Witwatersrand Medical School now includes ethics on the curriculum. Internationally-famous Dr Patch Adams who visited Children of Fire in September 2010, also believes that you can teach doctors to be compassionate. Our children however, have found to their cost, that caring is not an automatic attribute of a qualified doctor or nurse. So, while we work with stunning surgeons, giants among men, dreadful mistakes also occur in hospitals. The trend seems to be increasing and seems partly due to lack of supervision of inexperienced staff. One little girl ended up in intensive care in 2010 because a nursing mistake was made before she had surgery and she accessed food. The surgeon did not tell us she was in ICU! Four children have had amputations without informed consent in the past four years. The surgeon in each case might simply say that she/he knows best and that her/his opinion is not up for debate. Orthopaedic surgeons are far more likely to cut than plastic surgeons. Retaining even a non-functioning toe or finger is up for debate though. 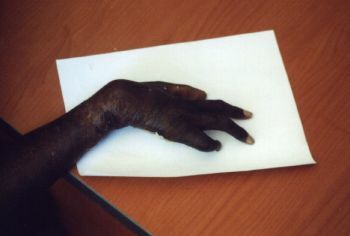 The first boy who had a finger amputated without his or our knowledge, stared at his hand in absolute horror when it was un-bandaged. 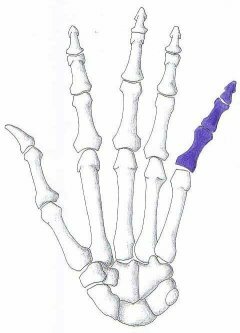 He said softly, with deep sadness: "Now I am a four finger boy." He felt mutilated and there was nothing we could do to restore his sense of completeness. If there were good medical reasons for amputation, we would still discuss it with a child beforehand, so that they could understand the science of it. They have the right to know the pros and cons of any surgical procedure and we find them capable of debating the issues easily from at least five years old upwards. A little girl who had two toes removed was accompanied by a would-be foster mother. We do not have that consent form but it is our understanding that the child hoped for her toes to be straightened even if they could not grip things. That particular girl is pretty but is unlikely to excel academically. Her appearance and the chance to wear open-toed girly shoes without shame, is important to her. That chance is now forever denied. A very young child had toes that could have been separated a little and with a skin graft on the top of his foot, could have been lowered to touch the ground and be useful again. The other foot was more complicated but on both feet the toe bones would still grow and still develop due to his young age. The plastic surgeon seemed to understand but the orthopaedic surgeon did not. As the child was in another city for the surgery, communication was difficult and the toes have gone. There are arguments about whether good skin cover is achievable but from our perspective, the surgeons would generally not do this if it was their own child, so they should not be so cavalier with ours. The whole spirit of Ubuntu is that my child is your child; that it takes a village to raise a child. We should all fight for the best possible outcome for each child - not second best because this is Africa or just the developing world... each child deserves to be recognised as the unique individual that she/he is and each surgeon needs to remember that the child will live with their quick snip for the rest of their lives. In 2010 a little boy went in to hospital for his complicated left hand to be improved. He could have had surgery with brilliant overseas surgeons in December 2009 but that was prevented by politics and egos. Earlier in 2010 his right hand had been badly botched in a different hospital with six operations where two should have sufficed. 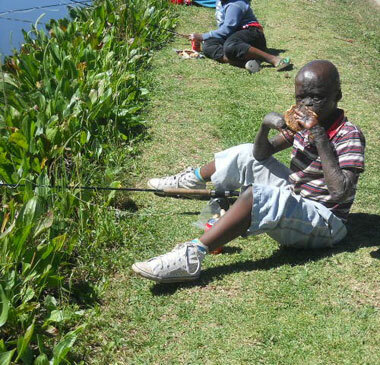 The boy's original problems stemmed from lack of splinting when he was first severely burned and treated in yet another hospital in another province. Mistakes compounded by more mistakes. The consent form did not use the word amputation. Again we and he were so shocked to find his index finger entirely amputated. We have video footage of him using the finger usefully before it was removed, that just happened to be shot by a film student competing for a Vuka award. Why? Why don't they talk to us beforehand? Why don't they study what the child can do with his guardian next to him and a good occupational therapist present as well? There should be a team approach for any such procedure with Children of Fire as part of that team. We have some 14 years of continuous experience not just in what is medically achievable for burns survivors, but all those years of listening to the children's hopes, dreams, fears, feelings. We know the cultural environment that they are from and that they will return to. We know the cumulative effect of endless teasing and how very important each body part is to a burns survivor. 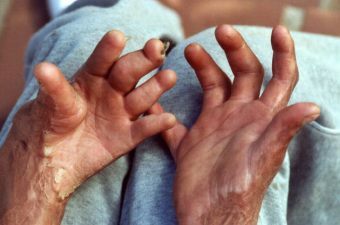 An adult burns survivor who was trapped in a burning car, had a hand remaining that was welded by flame and unsightly - but it could feel. It had sensation and it could do things. 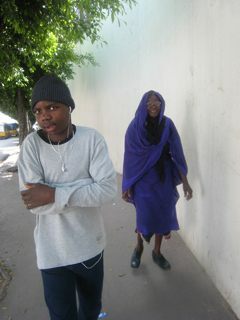 The young woman was in a very depressed state and briefly could access some medical aid. Her surgeon encouraged amputation and provision of a non-functioning false hand. We counselled her that even our children with stumps prefer to use them rather than having an aesthetically-pleasing but useless prosthesis. She was depressed about her drastically-damaged appearance and not in the right state of mind to make decisions. 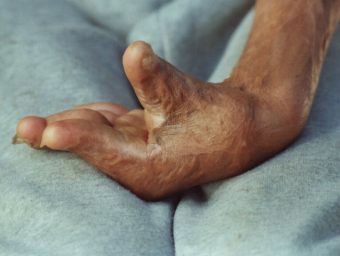 The hand was amputated. She then tried to commit suicide. That young lady is still alive. For months she kept her amputated hand in a box in the freezer where we had arranged accommodation for her. She was grieving her loss of beauty and she was grieving the death of her hand. She sought a burial service for the hand. 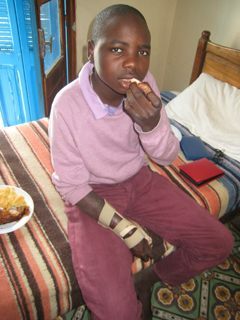 Sizwe (9) has a non-functioning little finger on his left hand. Orthopaedic surgeons have mentioned cutting it off. Sizwe will not go near them because he knows that he wants all his fingers. 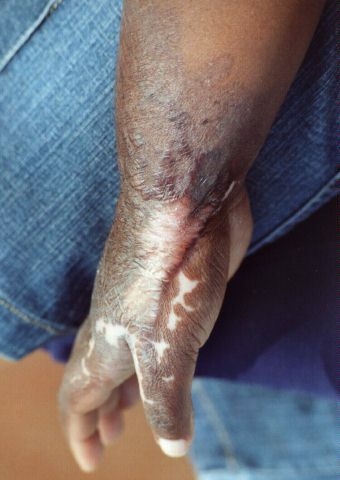 Kagiso (25) stopped going back to hospital when a surgeon at George Mukhari Hospital talked of amputating it. She might benefit from other surgery but she is not going back because she doesn't trust them. 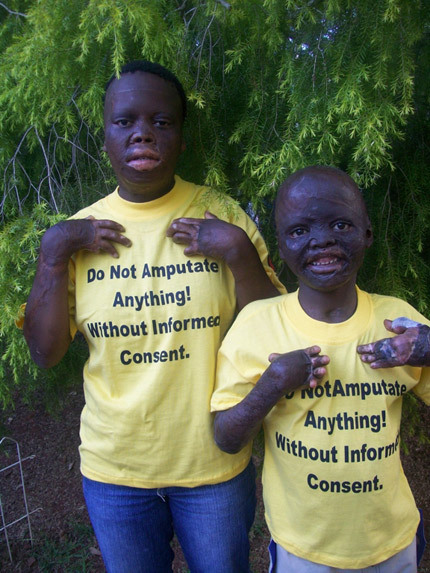 Sthabile, the older child pictured here, needs head and hand surgery. We have forewarned her that orthopaedic surgeons will most likely want to remove both her little fingers. If she doesn't want this, she needs to be empowered to stand her ground. 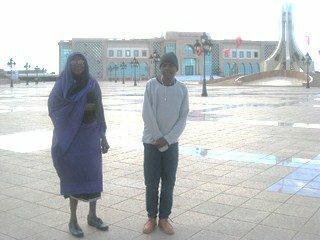 It is hard to be brave at only 14 and to speak your mind to authority figures. It feels as if some surgeons are shaping playdough - neatening the edges for their aesthetic ideal - and much too busy to talk it through with the kids on their level, in their time. It is time that they did. Thanks to Creative Inclinations in Turfontein for the T-shirts. We hope that the message is loud and clear. 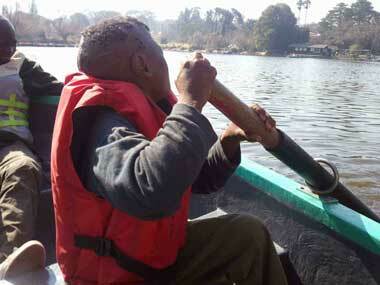 Feleng (8) tries to row on Johannesburg's Zoo Lake in June 2010, with two hands on one oar, despite the burn-shortened fingers on his right hand. What a difference digital distraction (finger-lengthening) would make. His friend Siyabonga is in the background..
Gloria burned her hand while making hot home-made polish from candle wax and paraffin. She lives in a squatter camp in Soshanguve, near Pretoria. Rachid with occupational therapist Donne Salamon and trial aeroplane splint. This was subsequently strengthened by a prosthetist and then the silly boys left it in bright sunshine after swimming and the thermosplastic distorted in the heat� With luck another one will be made. On 15th May 2008, Rachid set off for Tunisia to complete his medical treatment with Children of Fire North Africa. 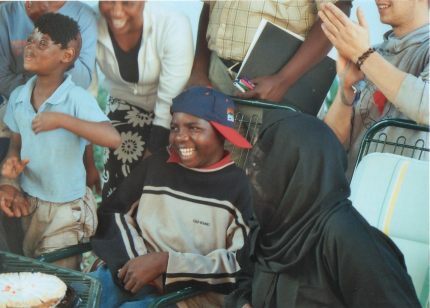 He had a farewell party with his burn survivor friends in Johannesburg, who love him dearly. Rachid's hand surgery in March 2008 was to straighten two fingers if possible, to make the child more comfortable with the aesthetics even if function could not be improved markedly. The first surgeon did not think it was worthwhile to attempt; another surgeon indicated that he would try. 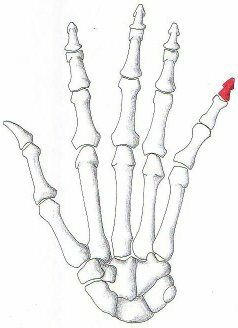 On March 18th we gave permission "if absolutely necessary" for the uppermost bone on the little finger to be removed during straightening, because the nail area was permanently damaged. That is shown in red in picture one. However, picture two shows what was actually done. The little finger was removed. At no stage did the charity give permission for this to be done. 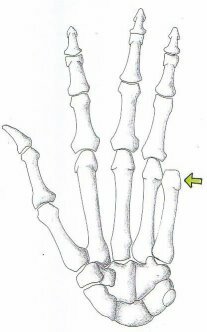 In picture three, one can see that the bones were moved inwards to narrow the hand. This was also done without consultation or agreement.